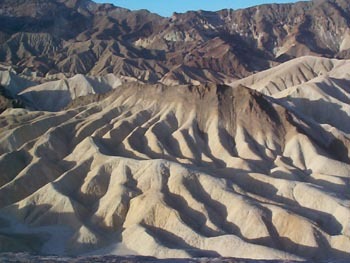 Death Valley... an American legend, and one of our newest National Parks. Once a formidable barrier that defied travelers who attempted to cross it, it now beckons us as a land of wonders. It is an awe inspiring, bold landscape of geology laid bare - great folded mountains, winding deep canyons, beautifully upthrusted rocks, vast salt pans, and magnificent sand dunes. Our exploration of Death Valley takes us from 6000 feet above the valley to near the lowest spot in North America, 282 feet below sea level. At Dante’s View, we’ll peer thousands of feet down into the valley below. On the valley floor at Badwater, we’ll marvel at the white salt flats, gleaming under clear desert skies. 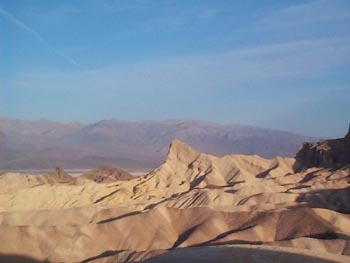 At Zabriskie Point, you’ll see how the power of wind and water has created fantastic patterns upon the hills and valleys, stained with rich hues of yellows, reds and browns. Yet all is not barren soil and rock. Seeping out of fractures in the bedrock is ancient water, an ice age relic, which creates oases of lush vegetation. Tucked away in protected bends of Titus Canyon are springs and rivulets that sport orchids and a rare desert poppy that only grows in Death Valley. At Saratoga Spring, there are pools and marshes of cattails with bitterns, herons and a variety of waterfowl. Stark contrasts like these define the rugged beauty of Death Valley. March is an ideal time to visit Death Valley. Temperatures are typically pleasant, without the extremes of later in the year. We’ll see migrating birds as well as some species on their breeding grounds. 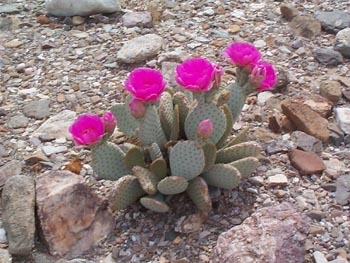 And there is the chance to see the desert in bloom. While we can never predict the “bloom of the century” as we had in our ’98 “El Niño” trip, we always see a good variety of flowering cactus and other plants. Deserts place severe demands on living things. The plants and animals of Death Valley have developed amazing adaptations and behaviors to survive. During our outings, we will discuss the secrets of survival of many of these fascinating creatures. Many of Death Valley’s organisms, like its famous pupfish, are found no where else in the world. Our base for this journey of discovery is Furnace Creek Ranch, in the heart of Death Valley National Park. Located beside an oasis of date palms, we’ll return each night to this comfortable lodge. For those who wish to have a day on their own, to relax or catch up on reading or writing, this will be easy to accommodate. Your leaders for this expedition are scheduled to be Gene Gartland and Peter Debes. Gene is a member of the faculty of SUNY Brockport, and teaches at the Educational Opportunity Center in Rochester. Gene has an M.S. in Geoscience from the University of Rochester. 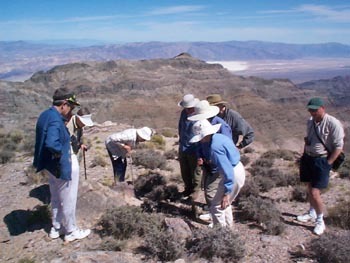 He enjoys leading groups to discover geological wonders throughout US Southwest, Rocky Mountains, and Alaska. His enthusiasm is contagious! Peter Debes is planning to join the group if enrollment warrants. A retired science teacher, Peter is a trained naturalist with a Master’s Degree in Environmental Science. He brings years of study and an intense interest in all things natural, especially birds, botany, astronomy, reptiles and insects. He has led previous expeditions to Death Valley, as well as many other destinations worldwide including Peru, Belize, and Southern Africa.